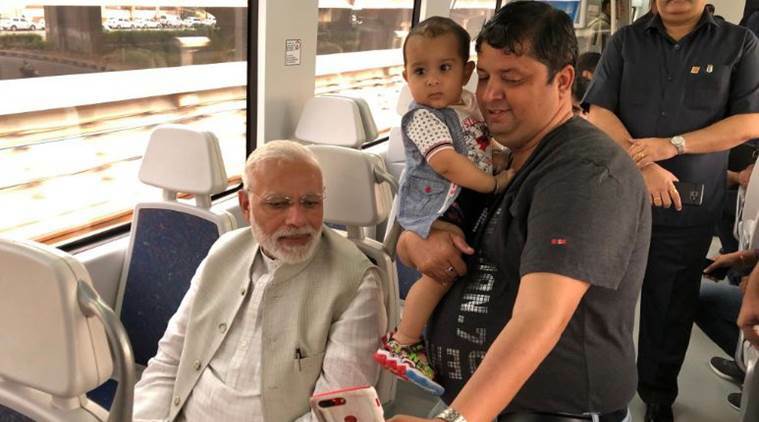 New Delhi: Delhi Metro commuters were in for a surprise when they saw Prime Minister Narendra Modi travelling along with them. PM took Delhi’s Airport Express Metro from Dhaula Kuan to Dwarka on September 20. He was on his way to lay the foundation stone of India International Convention and Expo Centre. The ride as per metro officials was completed in straight 14 minutes. During the travel PM met commuters, interacted with them and also obliged with photographs. Commuters were very happy to see PM travelling along with them and talking to them. Many also took selfies with him. As per DMRC’s senior official, PM commuted in Delhi Metro’s Airport Express Line. He boarded a metro train at Dhaula Kuan Metro Station at 3:13 pm and travelled up to Dwarka Sec-21 Metro Station, leaving the station at 3:27 pm. During the inaugural event, PM shared that the project is estimated to be around 26,000 crore. It will emerge as the centre of energy and attitude of 80 crore youth in the country. The India International Convention and Expo Centre will be set up in Dwarka’s Sector 25. The centre will act as a focal point acting as a vibrant centre for international and national business. PM also travelled back from Dwarka Sec-21 to Dhaula Kuan station in the Delhi metro. This is not the first time PM has taken metro, he has been using Metro services to reach distant venues. This is to avoid traffic jams that are usually seen during VVIP movement. Earlier Modi and South Korean President Moon Jae-in, had taken metro to reach a Samsung facility inauguration. He took the ride in July to reach the facility in Nodia. With PM travelling in metro, it sends a strong message to everyone that its best to use metro. He used the service to evade traffic, the common man should take inspiration and make it a point to use public transport. why Gino changed over and And maybe did sufficiently. I’ve no idea why Lynn ran in and actually seemed unnatural. Watch many different types of sports routes.